Went to Banapple yesterday to bond with Malcoln and Joy, then to The Ramp to do some styling and shopping for my bestfriend, Georgia! Anyway, outfit post before leaving for this fun date on a Saturday! It was about to rain that time so I opted to wear these. But yeah. Talk about the moody weather lately! Closer view of my outfit less the accessories! I love how it looks so laid-back. Now I'm about to show you some of the yummy eats my friends and I had at Banapple. As usual, everything tastes so glorious! 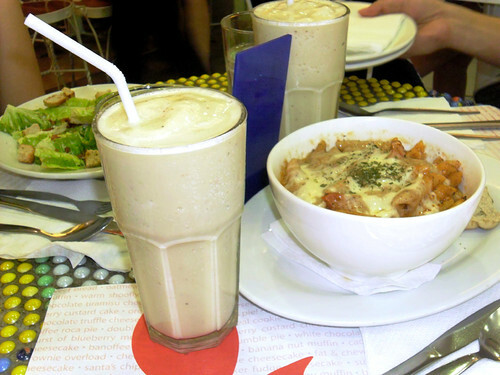 Picked this mouth-watering banapple smoothie and baked creamy cheesy penne. 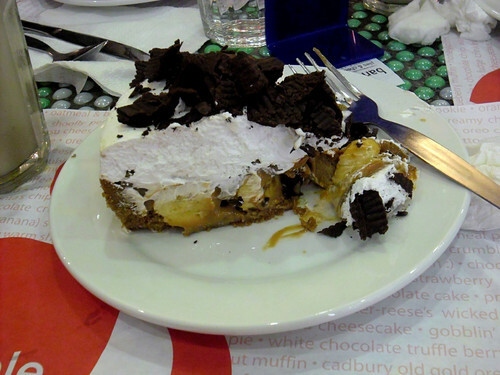 And your stay at Banapple won't be complete without tasting this banoffee pie! Something to die for! :p This made me abandon my diet! Check out Banapple's website here and download the list of their baked goodies and hot dishes! P.S. Let me share to you, too, one of my favorite quotes. I hope we will all keep this in mind and live by this. @Denise, hi sis!! :) Super daming excited for our collab. They've been looking forward to it as much as I do! ♥ Thanks a lot! Much love!